A little over a month ago I ran the Living History Farms race and fell in love with trail running and have since then been on a mission to find the illustrious trails in this area. There is a nice set of trails in the middle of Des Moines called the Center Trails and named such for being in the center of the city. I found the trail head and can't wait to give them a go. There are also some trails not far from our house in the Strasser Woods preserve that Jaymon found and we went to check out. There is a loop about a mile long that will be great for training and quite close to a small lake with a paved track and long biking and running trails that are also paved and well kept. 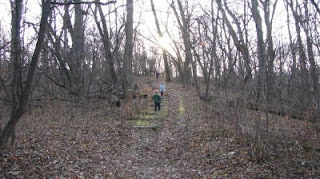 The photo to the right is of the boys at the top quarter of the hill. They were huffing and puffing with smiles at the top! The race was on Saturday the 21st and we left on tuesday to travel back to Salina Kansas for Thanksgiving. It was a much needed road trip and the fall weather held out the entire time. 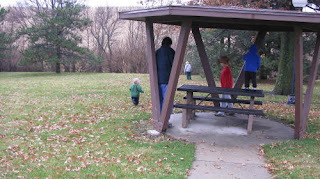 We stopped often to play around the rest stops (yay Milo and Jupiter, no accidents!) and stretch our legs. Once we arrived Jaymon fired up the wood stove which is such a welcome change from the forced air at our place in Des Moines. We got to see family and we were fed well and spoiled. 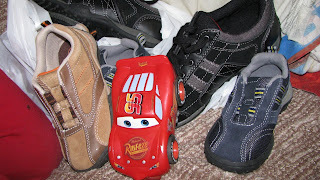 Grandma Linda and Aunt Sabra bought all 4 of the boys new shoes and Aunt Shannon bought them all snow boots and toys that they got to pick out. Uncle Jim labored long and hard to feed everyone on Thanksgiving day. Family and food, family and food! I went for an unplanned barefoot run and ended up with a 9.5 miler instead of the 4 or 5 I had thought I ran. I love going out to see the sights and then coming home to map it out on Google earth and find I went farther than I would have thought.The hill on Iron street and Indian Rock which once seemed steep and next to impossible to run without walking or passing out once at the top, were pleasant and at the same time disappointing. It was a lovely run all the same and it was nice to run through downtown and also to run through Oakdale park and to see the progress on the swim park. I made it home just as the sun was setting. 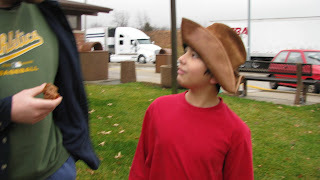 Jaymon stayed behind to reshingle Linda's roof and we headed back to Des Moines for school and therapy. It was difficult to be apart from my dear one and difficult for me to transition to him being in Des Moines again. I made him promise me to not fall off the roof and of course he humored me and came home unscathed. The day after we got home it got cold. Very cold. It has stayed that way since. 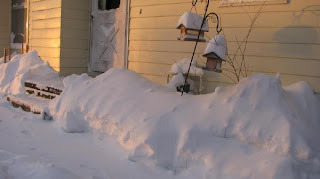 We have had 30 inches of snowfall this December and the city says they are already 2/3 through their snow removal budget and its only the beginning of winter. The photo to the right was taken after the first 15 inches. Another 15 was dumped on us over Winter holiday break. 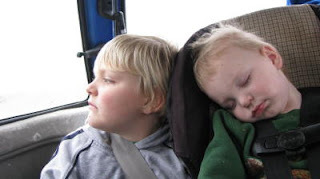 The cabin fever has been intense however we take the kids out for short walks or go to the Science center or Zoo since we were gifted a membership. We have been on winter break since the 18th and before that I was spending each day at school with Jupiter. We would stay for a couple of hours and get some work done. 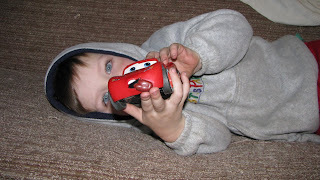 His behavior and aggression has increased and he is testing boundries at school and therapy. He is now going half days Wednesday through Friday and I take him for a couple of hours on Monday and Tuesdays after we go to Childserve for therapy. Speaking of Childserve....I have found an amazing group of women whose children receive therapy at Childserve. I look forward to talking with them and love to keep up with their lives through facebook in between therapy sessions. They are a compassionate and down to earth bunch that feel the same relief to talk to other mothers with children who have special needs. They understand the difficulties and heartache and celebrate the small stuff with as much happy dancing as I do. One of them is a Dresden Files fan and fellow SciFi geek!! Oh Harry Dresden how I love thee..... 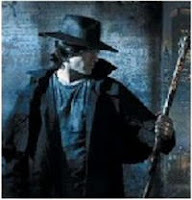 I have been devouring Jim Butcher's Dresden files books for a couple of months now . I am on book 10 "Small Favor" and have discovered the short stories that come in between as well as the graphic novels. They have been an excellent distraction from the sometimes stressful up and down nature of this time of year. As well as my daily Dresden supplement I also take 4000 i.u. of vitamin D a day and run about 24 miles a week on the treadmill. I run barefoot to keep up my sole conditioning. The universe interviened on my behalf to brighten my days even more when I won a pair of Sockwas from a fellow barefoot runner and general running enthusiast who has an excellent blog that graciously gives things away frequently. His reviews of running equipment and ramblings on life in general are a great read! Here is the link to Donald's blog Running and Rambling. I visit his blog often. 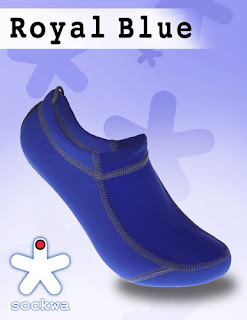 I won a pair of Royal Blue Sockwas. They are just a smidgen on the small size for my ginormous Peggy Hill feet but since they are of neoprene and nylon design they are stretchy and are still comfortable. I have not tried to run in them outside but blame that on the persistant ice and snow on the ground for lack of trying. If I wouldn't have known they came in a bigger size I would not have thought twice about the size. One of the downers of the month was the trip to the GI doctor for Jupiter. In short, he does not believe in leaky gut syndrome nor in flora imbalances and yeast issues. He told me that he would order an Xray to check for obstructions however what we were doing as far as a gluten and casein free diet was the only thing he would advise us to do. I did not learn anything new and the man was so well groomed and saturated in cologne and hair gel that I had trouble relating to him. It was a quick visit that, on the bright side, led me to a pediatric allergist that may be able to help. I want to be able to monitor vitamins and minerals and have her test for deficiencies. Cross your fingers for cooperation. I have been making late christmas gifts for family and Jupiter's class. They have been rewarding to make and I think they are turning out quite well. I will post photos after they are all handed out when school starts back up and the others have been shipped off to Salina and Manhattan to family. In the mean time here is a link to the gift instructions. They could be made out of any kind of greeting card for any occasion. I must say that they turn out much more adorable in person than the pictures show. To end this entry I want to share the good news that Jupiter was granted extended respite funds that will pay for him to attend Easter Seals Camp Sunnyside respite weekends for the rest of the winter and spring and he will be able to go to camp for the full summer as well. I am not much for new years resolutions however I have been thinking over the Ots decade and wondering what the next will bring. The Ots were my decade of babies and growing up and letting go. 2009 was a great year and I look forward to 2010. Happy New year everyone!! Missing some of the good ole days when you kids were as young as your own. Loving each of you, and hoping for more bright barefoot days ahead! Thanks for the link! Be sure to updfate when you put those Sockwas to the test. I wore holes in mine after about 60-70 miles, but I still use them sparingly. They're supposed to have a reinforced version this spring.